The growth of eSports betting has been well-documented over the past couple years, but just recently the rising eSports industry reached another major milestone. Total eSports wagers in 2016 have finally eclipsed a major North American sport – at least at one online bookmaker. Online betting site Pinnacle Sports reports total eSports wagers have eclipsed ice hockey wagers by 10% in 2016. Marco Blume, Trading Director at Pinnacle, predicted earlier this year that eSports would outpace ice hockey by the end of 2016. His prediction played true with plenty of time to spare. In a more recent update, Pinnacle Sports informs us that the number of eSports bets placed this year increased nearly 130% over the previous year, with a 111% increase in pre-game bets and a 400% increase in in-play bets placed during matches. As we can see here, the three big winners of the year are Dota 2, Counter-Strike: Global Offensive and League of Legends. All three saw major gowth over the last year alone. Bets placed on Dota 2 increased by more than 200% while bets on CS:GO and LOL increased by 166% and 98% respectively. The one game with fewer bets placed this year was StarCraft 2, which saw a reduction of 21% in bets placed. We can fairly safely blame the declining numbers there on lower viewership numbers for StarCraft 2. Of course, we’ll need to take these numbers into context. For one, ice hockey and the NHL specifically are not the most popular markets in the world. Pinnacle does not accept customers from the United States where hockey betting is particularly popular. That automatically sets sets the bar for beating a major North American sport a little lower. It’s still quite an accomplishment, but it’s a far stretch from beating out a bigger sport such as baseball or American football. 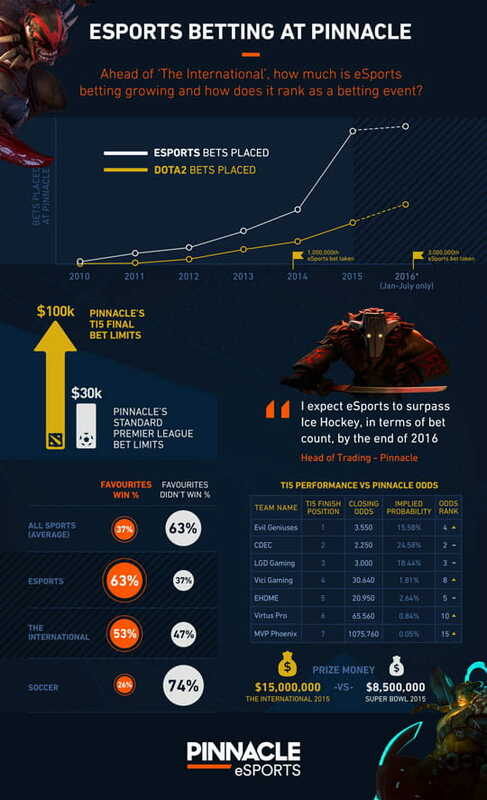 It’s also worth noting that Pinnacle has pushed the eSports betting angle more than just about any other online bookmaker. They offer more eSports bets than most bookmakers and regularly update the website with in-depth previews of upcoming matches, eSports betting tips and so on. Most major betting sites still treat eSports betting more as a passing interest than as a key business driver. Pinnacle has thus situated itself as one of the main sites eSports enthusiasts are visiting to get their gambling on. As such, Pinnacle is not a typical betting site that we can use to assumptions about the industry as a whole. Even so, it is clear eSports is on an upward trajectory with growth levels that haven’t slowed a bit since at least 2014. These trends are not related to Pinnacle alone. Everywhere we look, eSports betting is growing, not declining. Just last month, eSports betting officially made its debut in Las Vegas with William Hill US partnering with the Downtown Grand Casino to begin offering the first eSports markets in Las Vegas. A post published at eSports Betting Report explains that the Downtown Grand will be sticking mostly with major events as eSports catch on in the US. eSports Betting Report spoke with Seth Schorr, Chairman of the Downtown Grand, and he told them hey will be focusing primarily on MLG events in 2017 and then look to expand from there. The growth of eSports gambling has caught the attention of more than just online bookmakers and Las Vegas casinos. Sports betting data firm Betradar just last month announced it has entered into an eight-year partnership with DOJO Madness to offer live, in-play betting services for bookmakers that offer eSports betting. DOJO Madness was originally formed as a company leveraging data and technology to “help gamers master their play.” Now, DOJO Madness be using its unique skillset to provide live betting odds and pre-match odds to Betradar, which will then pass those odds on to online bookmakers wanting to offer eSports betting. This all comes on the back of Betradar estimating the global wagering market for eSports to top $23 billion by 2020 and generating $1.81 billion worth of revenue for betting operators. eSports has also caught the attention of some gaming regulators. More specifically, the biggest and most effective regulator of them all has taken up the issue of eSports betting. The UK Gambling Commission published a white paper back in August and noted that eSports are in need of regulation just as much as any other sport. That report was published precisely because the Gambling Commission itself has acknowledged the growth of eSports betting. Overall eSports betting handle is still fairly small relative to all the other sports of the world, but it has been growing quickly with no signs of letting up any time soon.